Price! Onion seeds are far cheaper than sets, see our comparison below. You have a larger choice of varieties. The sheer pleasure of knowing you will be growing from unadulterated seeds to the final crop. Below is your calendar for growing onions from seeds. The dates displayed below are correct for the UK average. If you want them to be even more accurate and adjusted for your area of the UK / Ireland / France click here. It only takes a minute and the adjustment affects every date in this site and lasts for six months. This section explains in detail about the root system of onions, if you understand their roots you will be in a much better position to grow a better crop. If you wish to skip this section and go on to the more practical steps in growing onions then click here to skip this section. Onion roots grow much deeper than most gardeners realise, typically the longer ones reach a final length of 80cm / 30in. The roots are thin and very fragile. This is one reason why deep digging of the ground before sowing seed (and transplanting seedlings) is so beneficial to onion crops. The looser the soil is at depth the better the roots can develop. The spread of the roots, width-wise, is far less, 30cm /12in but still wider than most realise. When you transplant a young onion plant, as long as the root ball remains in tact, little damage is caused to the roots. However when you thin seedlings it is likely that the action of removing the seedlings does damage the remaining ones. For this reason we recommend thinning onion seedlings as early as possible to minimise root damage. 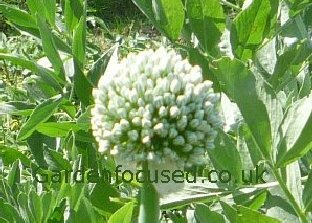 Most sources recommend regular weeding of onion beds but they fail to mention that the timing of weeding is absolutely key to the good development of the bulbs. As with thinning the seedlings, it's important to remove weeds at the earliest stage possible to avoid damaging the roots of nearby onions. Weeding when the ground is damp has also been proven in tests to reduce onion root damage considerably because the weed roots come out cleanly. If you have a good hoeing technique (which removes just the tops of weeds) then that is probably the best solution to the weed problem. When onion roots are damaged by weeding or thinning two things happen. Firstly the plant's ability to absorb moisture and nutrients is, of course, reduced. Probably even more important though is that onions stop growing when their roots are damaged. This is a natural process which is triggered automatically because when onions, that are not disturbed, reach maturity they let their deepest roots die as as part of the maturing process. Damaging the roots for whatever reason is like telling the plants that they have reached maturity and the reason why they stop growing larger. So, to sum up the subject of onion roots; thin seedlings as soon as possible and remove weeds as soon as possible, do both tasks when the soil is damp to minimise root damage even further. If you want to research this subject further we suggest reading this article here. It is very informative and based on real trials in the field. We have practiced the principles explained above and found them to work very well. If you study how giant onions are grown you quickly realise that although the growers might not understand the principles behind their growing techniques, they do in fact follow the principles explained above. SOW ONION SEED INDOORS OR DIRECTLY IN THE GROUND? The two common methods for sowing onion seeds are sowing under cover in pots (inside, in a greenhouse etc.) or sowing them directly in the ground outside. Our preference is to sow seeds in pots indoors but it is the most time-consuming of the two methods. It results in larger onions which mature a few weeks earlier. 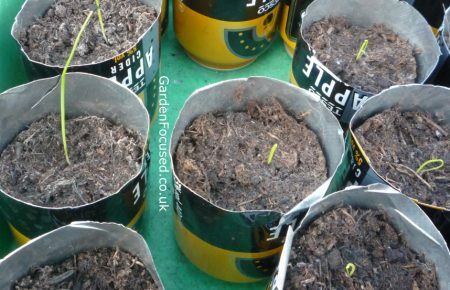 We have tried sowing outside also with great success, the onions initially appear to be growing far too slow but once established they grow much better than expected and nearly catch up with seed started off inside. HOW LONG CAN YOU KEEP ONION SEED? The short answer is that onion seeds will remain usable (i.e. retain germination capabilities) for two or three years. The germination rate of onion seeds deteriorates after a year but the quality of onions grown from seeds which do germinate remains the same for many many years. Personally we buy new onion seed each year but if you want to keep it for two or three years simply sow more seeds to allow for the reduction in the germination rate. Onion seeds should be stored in a cool, dry and dark place. As with most seeds you can test the germination by placing a few seeds on a damp kitchen towel covered by another kitchen towel. Place them in a warm position and wait for three or four days. They will sprout little growths from the side of the seed if they geminate indicating that they fine to use. If nothing happens then you probably need to buy new seeds. As far as we know there is no other reliable method of knowing how fresh onion seeds are, certainly not by looking at them. Many seed packets nowadays have dates on them. We looked at the prices for buying sets and seeds for growing in 2015. It is something of a generalisation but sets work out at roughly £4.00 per hundred or 4p per set. Onions seeds worked out at about £1.60 per per pack of 300 to 500 seeds. Given that onion sets last only for the current season and onion seeds can successfully be used for two year it's clear that onion seeds are by far the cheapest method of growing onions. We have reviewed over 20 onion varieties widely available in the UK. Click here for the comparison report. Individual onion seeds are small so the first thing to get correct is the soil into which they are to be grown. This needs to be dug to a fine texture so that the tiny seeds are not overwhelmed by clods of earth. Repeated digging of the top 30cm / 1ft (further if possible) will also assist drainage, allow good root growth and at the same time allow the ground to maintain moisture. Remove any stones you come across. If the ground is light and sandy, heavy clay or poor in nutrients add as much well rotted compost as you can and work it well into the soil. It's an excellent idea to sprinkle on a good handful of blood, fish and bone per square metre / yard as you are digging and incorporate it into the soil evenly. Onions should not be grown in the same soil as a previous crop of the onion family and we strongly suggest that you read our page about crop rotation to decide exactly where is best to grow them. The ideal time to sow onion seed outside is in spring after the soil has warmed up a little in the last week of March. Rake the surface of the soil over to ensure it is even and any lumps removed. Take a plant marker or the edge of a trowel and draw a straight line in the soil about 2cm deep. Water the soil if it is not already damp. Sow the seeds thinly into the grooved line you have just made. For an idea of what "thinly" means, remember that you will need to thin the seedlings eventually to 10cm / 4in apart so you are looking to sow one seed every 3cm or so. This is difficult to judge in practice because the seeds are so small but that, at least, gives you some idea of what you are aiming for. Gently draw some soil back over the seeds and pat the surface down gently. Place a marker with the name of the variety at the end of a row. Rows should be planted 20cm /8in apart. Stand back and admire your handiwork in anticipation of a very cheap crop of delicious onions in August! Sowing onion seed indoors in pots gives you a head start on the growing season and normally results in a larger crop. Start to sow indoor onions in the first week of February. You can initially sow the seeds into small modules but they will need to be transplanted into 8cm / 3in pots later on so forget the modules, sow them straight into larger pots and save yourself the bother. Fill the pots to 3cm /1in from the top with multi-purpose compost then place two seeds, evenly spaced in each pot. Gently pat them onto the compost surface to ensure they are in good contact with it and then sprinkle on 1½cm / ½in of compost to cover the seeds. Water the pots from below by placing them in a container of water for an hour or so. Until the seedlings emerge they don't need light. Place the pots in a warmish place, the ideal germination temperature for onions is 20°C /70°F, but any temperature in the range 16°C /60°F to 26°C /78°F will do the job. The seeds will take somewhere between seven and fifteen days to appear depending on the temperature. As soon as they appear move the pots to a light, cool and airy part of the house, a windowsill is probably the best position although a conservatory or a greenhouse with basic heating are even better. The onions will grow at a minimum temperature of 10°C /50°F. They can withstand temperatures just above freezing but will be affected if these last more than a few days. If more than one seedling appears, pull out the weaker one as soon as possible leaving just the strongest. As they continue to grow keep the compost slightly moist which will require only occasional watering because the plants, at this stage of their life, absorb very little moisture. Whenever the temperature permits, place the plants outside so that they can benefit from as much natural light as possible. If you do this you will effectively be hardening the plants off over a couple of months because as the temperatures begin to rise from mid March onwards the plants will increasingly be outside. Prepare the planting site in late March / early April by digging the soil as described above for sowing seeds outside. In the second week of May choose a dry day, but when the soil is moist (water an hour beforehand if necessary), to plant the onions out in their final positions. A moist soil will cause less damage to the roots of the transplants. Turn the plants out of their pots doing your very best to avoid disturbing the roots. Use a trowel to dig a small hole and place the plant in the hole infilling with soil. It should be to the same depth as it was in the pot. Each plant should be 10cm / 4in apart and rows should be 30cm / 1ft apart to allow for hoeing weeds. Water well again. If you have sown seed directly into the soil outside than you will need to thin the seedlings as soon as they emerge which is normally 21 days after sowing. The aim is to have the plants 10cm / 4in apart and we recommend that you thin to this distance at the earliest chance possible (see here for the reason). Onions prefer a regular supply of nutrients at a low level, too much nitrogen encourages foliage growth at the expense of the bulbs. The best feed is a long-lasting one such as blood, fish and bone given monthly at the rate of a handful per square metre / yard. Sprinkle it around the plants and gently work into the surface with a trowel taking care not to damage the roots. Onions do suffer if the soil becomes dry in warm conditions because their root system is not designed to cope with drought. Water in dry conditions, it's best to water infrequently but with lots of water when you do. Weed frequently when the weeds are small to avoid damaging the roots of nearby onions. In mid July, when your onions have formed well, stop watering and feeding. This will encourage them to go into "maturing" mode resulting in onions which have thin necks and hard bulbs both of which help them store for a long time. If you encounter any problems with pests or diseases consult our page on this subject. Onion seeds are very cheap to buy so the main reason for collecting your own is the satisfaction of knowing you did it. Onions are biennials, which means they grow in their first year but only produce seeds in their second year. This causes a problem in many parts of the UK where winter temperatures are low because you can't guarantee that onion plants will overwinter in the ground. In these areas, the onion bulbs should be dug up, kept cool until the spring and then re-planted when the soil has warmed significantly. Do not save seed from F1 onion varieties, they will not come true to type and in almost all cases the resulting crop will be a disappointment. In the second year, occasionally the first year, flower heads will form and theses should be left until they start to turn brown. Cut the flower heads off and store them in a paper bag in cool, dry conditions for about a month. At this point shake the dried out flowers over a table and the black seeds will fall off. Separate the black seeds from the chaff and store the seeds in marked paper bags in cool, dry conditions until you need to sow the seeds next year. When I transplant my onion seedlings into the main garden should I trim the leaves down to about 5 inches? ANSWER: Some do, some don't. For me if the stems look like they will flop over when they are transplanted I trim them. If not I leave them alone.